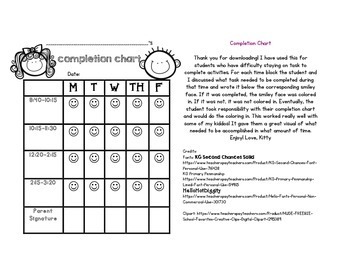 This chart/rubric is great for students who have difficulty staying on task to complete activities! For each time block the student and I discussed what task needed to be completed during that time and wrote it below the corresponding smiley face. If it was completed, the smiley face was colored in. If it was not, it was not colored in. Eventually, the student took responsibility with their completion chart and would do the coloring in. This worked really well with some of my kiddos! It gave them a great visual of what needed to be accomplished in what amount of time. This also was a really simple and effective way to support school/home communication! Like what you see or have any advice? Let me know below!